Sharing my favorite shooting locations with you all is so much fun! This post is the third in a short series. Want to see the first two posts? They're here and here. The next location that I want to tell you about is a little hidden gem in Newport. The good thing about being a RI family photographer is that RI isn't that big, and I can find lots of great locations that aren't too far away. Newport can sometimes seem like a whole other world to those of us on the "other side of the bridge", but fortunately it's a quick drive away. I found this lovely little wooded dirt road one day when I was walking in Newport. As soon as I looked at it, I fell in love. This beautiful spot is very close to the hustle and bustle of downtown Newport and Bellevue Avenue, but you'd never know it. A perfect spot late spring through fall, it works on both cloudy and sunny days, with cloudy days making the deep greens in the trees pop, and sunny days adding beautiful backlight to the photos. This spot has been a favorite for princess sessions, but it's also perfect for a family session! Family portraits in this spot would look fantastic on your walls and in an album. Just a bit further down the road, there are some well-manicured hedges for more variety in the photo opportunities. And on sunny days, that beautiful light at the end of the street is perfect for twirling! As an added bonus, Cliff Walk and the ocean are right there. Just right on the opposite side of the path. Want some photos in the forest as well as by the ocean, all in one session? We can totally do that! I've seen lots of pretty skies in the evenings at this spot, and that big piece of driftwood sure is nice for sitting and posing. 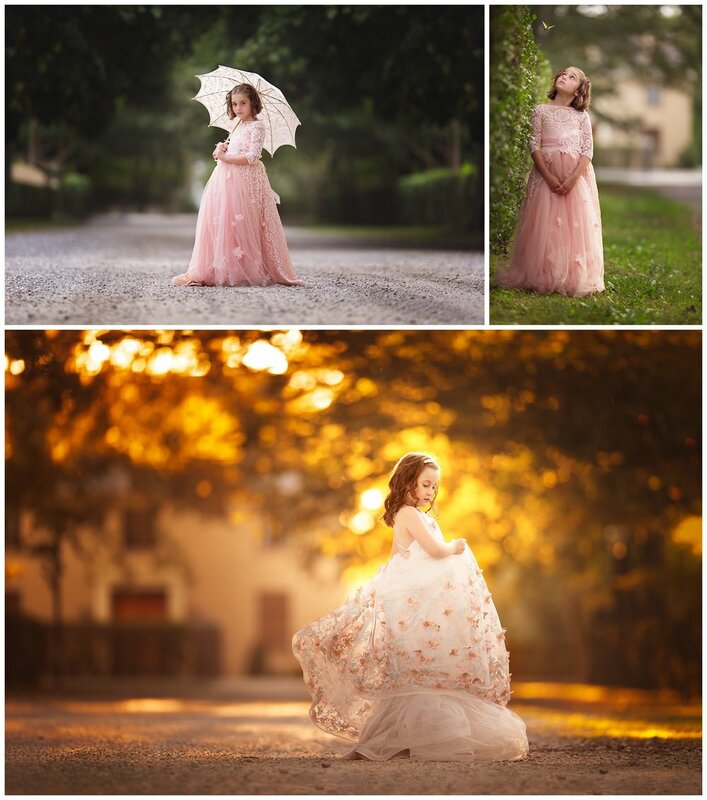 To book your family or princess session at this special Newport location, get in touch!